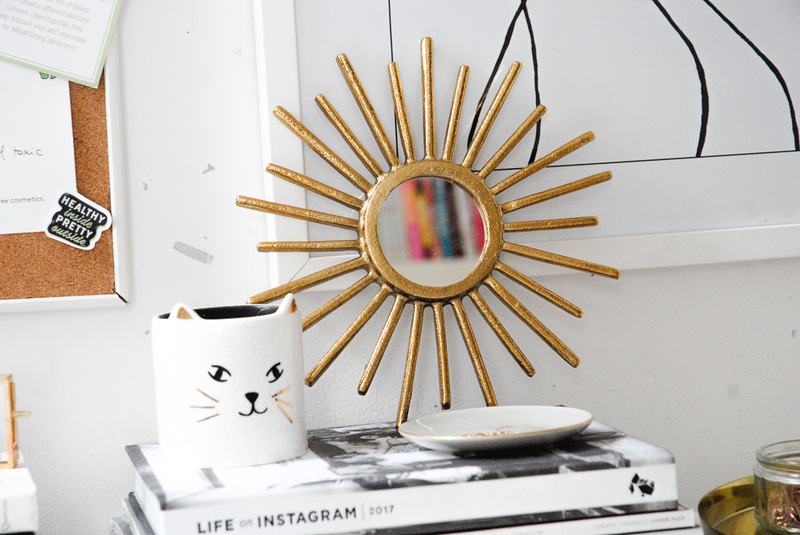 What you might not know from just reading my blog is that I a bit of an interior lover. Meaning, I take great pride in making sure that my area is decorated and styled in a way that I like. I thrive off of that feeling you get when you walk into a room that is just so gorgeous and I could spend hours on end arranging and re-arranging different areas of my room. 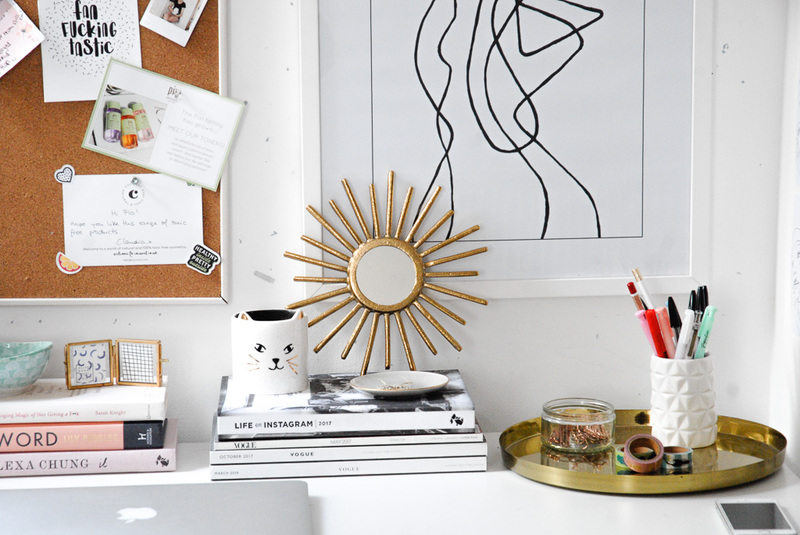 My desk, in particular, is an area that I love to re-style every now and again. Possibly because I get bored of it the quickest, which isn't surprising seeing as I spend such long periods of time sat at it. I feel like theres always something that could be added to make it that extra bit pretty, which is always apparent to me after having a nosy at Kate La Vie's office - seriously, how does she have such a good eye for styling? 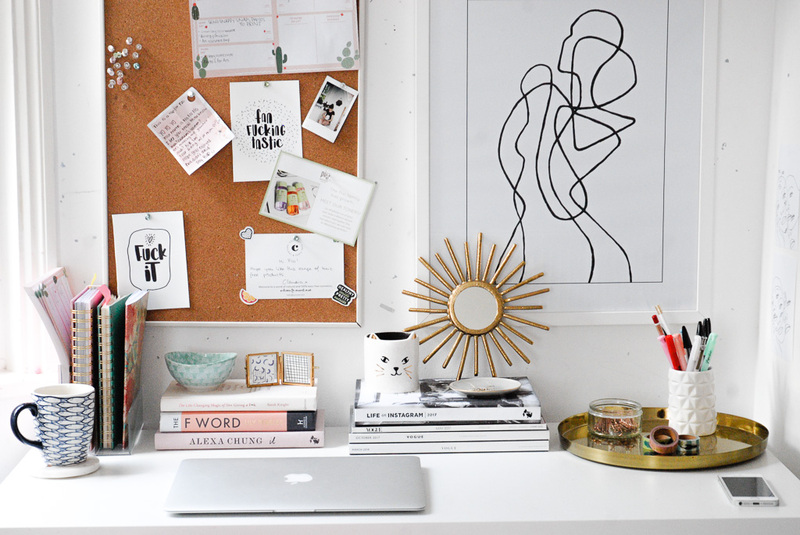 I've spent hours looking at Pinterest-worthy homes and work spaces online and have taken inspiration from just about everywhere in order to create my own work space that feels very me. And now, after many H&M home orders I feel like I've succeeded in creating my very own, very pretty, desk area. 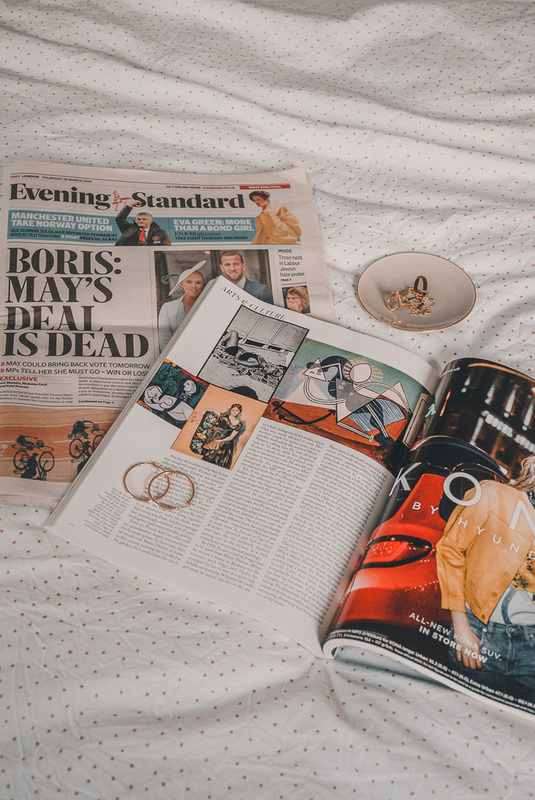 The Gold Mirror from H&M home, which I have placed on a stack of magazines along side my Oliver Bonas candle, feels like the focal point of the work top. It stands out from the otherwise fairly neutral background, which I love. Around this whole section, if you will, there are pops of gold against the black and white of the magazines and the one book. When styling it like this, the black and gold coming together was something I never intended to happen, it was more of a coincidence that they went so well together. And if I'm honest, a bit of a surprise. If you had asked me two months ago if I thought black and gold would look good together I would have laughed at you, but I'm actually loving this combination. To go along with the black and white books, is this Desenio print. 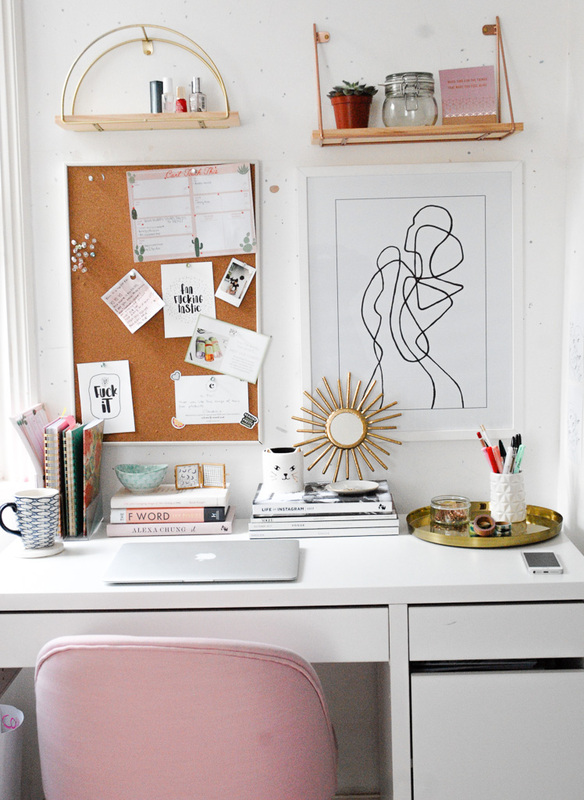 The simplicity of the print is something I appreciate, as I wouldn't choose to hang something much busier up there purely because the actual desk already has a relatively cluttered feel to it. But, its a gorgeous piece which fills the wall space perfectly. This looks super cute - a nice place to work definitely makes a difference! 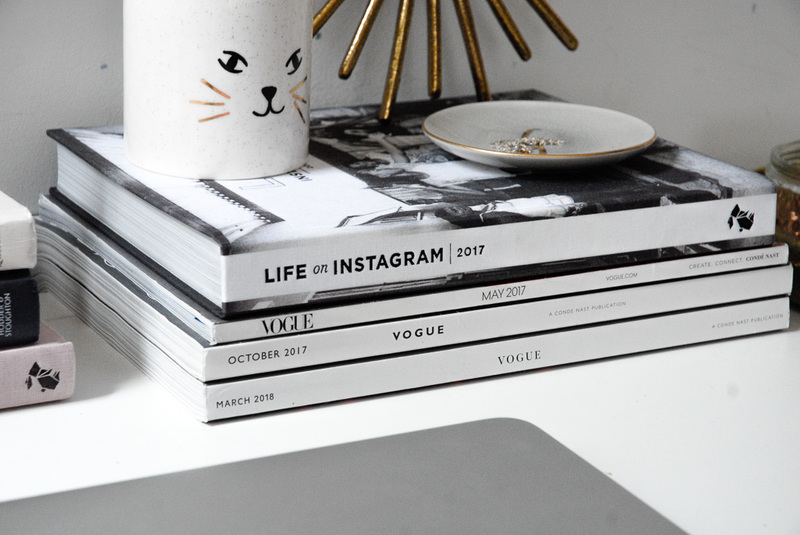 DESK GOALS! So pretty babe! I love that art piece on the wall! It really pulls everything together. And of course the cat mug! Those little shelves are the cutest! I need to find a couple of those for my desk space. 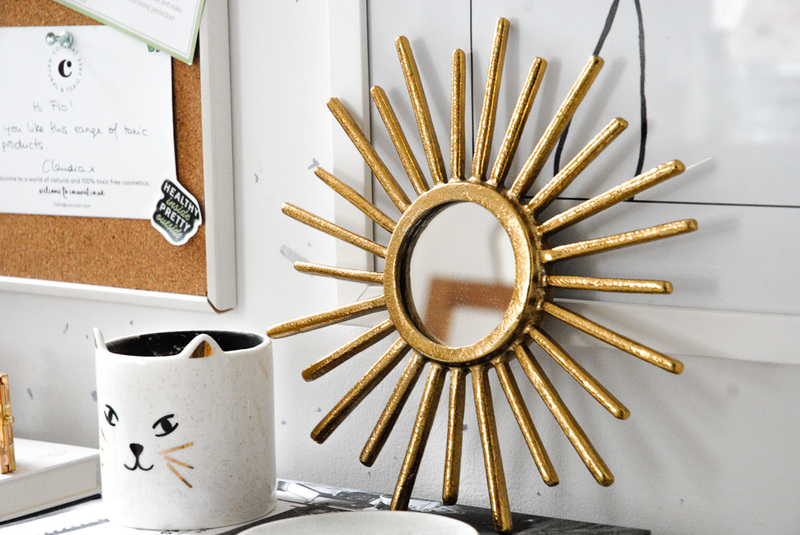 I LOVE your desk decor! So many wonderful pieces and It's very inspirational!